So I'm replying to a comment on my hub and upon scrolling through the hub (I always check for errors or how I can improve), I see the related hubs section. There are five hubs there including one of mine. What immediately got my attention is that the other four hubs has "editors choice" displayed on them. It's so prominent that it's hard to miss. 1) I have opted out of the program so there is no way my hub would ever have that displayed among other hubbers hubs. This gives me a distinct disadvantage in case readers think that editors choice means better quality. 2)Displaying so many editor's choice hubs on someone else's hubs encourages readers to click away...again, if they feel that this accolade means better quality. Editors choice should be displayed on the hubber's hub. It's like advertising another person's hubs on mine. The related hubs section was accepted because it encouraged readers to stay on the site but with this display readers may feel that there are better articles about the same subject and just not read the one they found in the first place. Thanks Paradigm Search. I replied on his hub. I am now realizing a lot of people were thinking along the same lines as myself. Something needs to be done about this. The best thing we can do for now is to opt out and hope others read our concerns and opt out. out of 122 hubs, i have only four ec hubs but these hubs do not fetch good traffic either. I think a way to solve the problem is for hubbers to be rewarded either with score credit or money credit (ads) for every click made on their hubs. So that if a reader came to my hub and clicked on 2 or more Related Hubs or EC Hubs, those clicks should reflect an increase my scores, otherwise what's the point in having them, beyond promoting someone else's hub. I agree. They've done this all over the site, even where all featured hubs are listed when you click Explore>Hubs. Of course, not all hubs will be chosen for the program if the hubber is opted in. But I think the idea is to deliberately make those of us who have opted out feel at a disadvantage in order that we are encouraged to opt in. In other words, to make us think we appear second rate. I can't think of any other logical explanation. As a visitor, I would definitely be more inclined to read a hub labeled 'Editor's Choice'. Only we know these hubs are not necessarily the best. Labeling in this way would only be fair if we were all participating in the program. The other annoying thing is that the 'related' hubs are still not very related in many cases. If the EC label does indeed encourage people to click on the other hubs, readers will be disappointed to be led to a page about a different topic. I actually like that HP wants to make top-quality content stand out, but implementing this new featured before fixing the relatedness of related hubs was a mistake. In the early days of EC I found that traffic to my EC hubs fell and didn't seem to recover, so I opted out. I'm still happy to be out. What bothers me most about so many hubs being EC is if someone reads one thinking 'Oh, this must be a really good article' ... and then finds it is 'unimpressive' (as many are). That must shake the confidence of at least some readers if they think they've just read a hub considered among the best of the best - as one would expect if an 'Editor' chooses to recommend it. As far as individual hubbers are concerned, it must be somewhat annoying to have the banners on their profile pages. Sure, it might be exciting to have 20 EC hubs ... but if they have 50 hubs in total, it implies that 30 of them aren't worth reading. Hmmm. I wonder if those who opted out should change the text in our profiles to begin with "For many reasons, I have chosen not to participate in HP's 'Editor's Choice' program- so you won't see any banners on my hubs." If 'Editor's Choice' is a sign of approval for hubs that are removed from sub-domains and featured directly under hp, why can't there be a comparable banner for hubs that still remain under the original sub-domain (as ours do) but are also acknowledged as being above the chosen standards applied to EC? I agree - this not only works against writers who have opted out, it sets up contention and ill feelings among the community here. When this program was started, I was defaulted into it (had no choice at the time due to another program I was in). It was sold to us as a way to get our work 'promoted' and attract readers. However, nothing was done to 'promote' those hubs - the only change was in the url. Sadly, the only impact I saw from being in the EC program was that my work was impacted by the reputation HP has in Google searches. Recently, I opted out of the program - for several reasons. Now, HP has belatedly decided to 'promote' EC hubs. That's fine - it's about time. But the manner in which this is being done is not fine, by any means. We were given the impression (a few years ago) that the promotion would be through other means. Do not penalize people who are not in the program, and do not use the real estate on pages of people who are not part of the EC program to post titles that appear to be 'advertised' as 'better.' That is baloney. Well-stated, Marcy. I posted on a forum I'm reminded of by Cardisa's concern. I felt a disadvantage brewing with the new EC program and how it is now a prerequisite to being considered for HOTD. Now that we see how the EC rewards are working out, it definitely seems to create an atmosphere of imbalance and unfairness. But because the program is brilliantly designed as voluntary, we, who have chosen to remain opted out, are stuck. I don't like feeling forced to participate in order to receive recognition of my work. I was initially excited about the upgrades to the EC program but, as you have said, "for so many reasons," I will continue to wait it out. Also, when I opted out of the EC program, my pageviews went up 25%. I don't want to lose views in order to participate. Please HP, reconsider the EC labels and the new rule which now includes EC designation as criteria for HOTD. I am beginning to feel the impact: traffic to my hubs is abysmal and I don't think there's a Panda bear or Penguin running loose. I admit that my enthusiasm has decreased as a result of feeling like a "stepchild" because I chose to opt out of EC and that no matter how stellar of a hub I create, it will never be a HOTD. I didn't mind before and actually applauded my fellow hubbers who received ECs. I even had 6 myself before I opted out in Dec of 2013. But the labeling has changed the playing field and the atmosphere of camaraderie many of us have come to love about this community. I think I make pretty good hubs but now my chances of sharing them with readers outside of HP have decreased which is why I believe my traffic has plummeted so much recently. EC labeling creates a different form of competition between hubbers. I think we can all live with competing for reasons like quality, appeal, interest, uniqueness, and originality. But not with a label that does not necessarily indicate a higher standard of hub. Please take a closer look at this and reconsider. When they show related Hubs below the content they may be from other readers than yourself. It has always been that way. Any related to you are shown up top at the right (sometimes left) of your content below your profile photo. You have completely missed the point of this discussion. Okay. I just reread what she said and I see what you are saying. EC does not necessarily mean better quality. What the viewer reads depends on their likes and desires, not only what something says. The other four Hubs have similar titles, hers is the only one which mentions Jamacian food. If that is what they are searching for then the others are unimportant. What are Editor's Choice Hubs? Editor's Choice Hubs are exceptional Featured Hubs that represent the very best of HubPages. Each Editor's Choice Hub is hand-selected based on its individual merits. Editor’s Choice Hubs will also be eligible to become Hubs of the Day, be shared more often on the official HubPages social media channels, and become eligible to be featured in our Weekly Newsletter. Additionally, authors who write a new EC Hub will automatically be entered into the month’s random drawing for a chance to win $50." So much incentive to join, it looks like non EC hubs just don't count at all any more. The whole program is presented as if it was a great honour to have your content removed from your own sub-domain. But to me it looks like HP are building up their own domain (hubpages.com) with their authors' best content. It feels like they are trying to persuade us to allow them to steel our best content away from our own sub-domains. And that is why I don't like the idea. Why do they need hubs in the hubpages.com domain anyway? I am not against rewarding quality, but fail to understand why our "best" hubs cannot remain on our own individual sub-domains. I am now wondering whether I should join the EC program again although I don't agree with my hubs being taken off my own domain. It feels like giving them away for free to someone else who is raking in the benefits. The current system seems very unfair to those of us who have opted out with good reasons. On reflection, I would only ever join again if we were allowed to keep the "selected EC hubs" on our own sub-domain. Like you, Sue, I'd do it if my EC hubs stayed on my own sub-domain. "It feels like they are trying to persuade us to allow them to steel our best content away from our own sub-domains. And that is why I don't like the idea." Having your best hubs stolen from your subdomain must reduce your rating and authority with Google. There are many other issues with linking, sitemaps, etc. etc. I think there are site wide issues as well as it complicates all the sitemaps and loads up the number of 301's, etc. It is a very bad idea IMO (good for HP - bad for subs). Nothing to gain, everything to lose. @janderson99 I'm less convinced that the URL matters since we originally moved to subdomains and then put some content back on the main domain. As far as the technical issues go, we put urls in the correct sitemap files and we update links on HubPages so they don't redirect (on hubpages). The idea of EC is that it would be good for community members that had Hubs selected. As far as I can tell, it doesn't have much of an impact for NEW hubs. About a year ago I looked at the URL structure of HubPages pretty deeply and started the discussion again a few weeks back. Nothing to report now, but it is something we look at and want to have the best practice in place. Whatever we choose, we try and implement these things to benefit the community as a whole. If leaving all content on a subdomain was better we'd do it or if moving content to a different structure we'd do that as well. Right now, i don't see a clear winning strategy with our current content mix. However, I still think it's important to continue to evaluate and see what we can learn. Thanks Paul for the update. Cheers from Down Under! Sue: I feel exactly like you do, which is exactly why I opted out right from the start. I don't want my best articles to be removed from my subdomain, because doing this undermines the rest of my articles there. I have always felt that this was an attempt by HP to salvage its reputation by using an easy way to eliminate the low level and spammy articles. Had I been the one making the decisions, I would have included the very best subdomains after telling the authors which articles needed to be removed prior to inclusion, if any in order to maintain quality. Doing this job piecemeal was never a good or viable idea. I have a serious problem with this as well. In the past I have expressed concern over the way Related Hubs are chosen. Often I have a very related hub that gets bumped in favor of a less-related hub by another author. That really, really makes me angry. Now it seems like Editors Choice are getting a boost in Related Hubs. Not cool. I wish HubPages would consider allowing Hubbers to control what appears in the Related Hubs section for their Hub, as well as the supposedly related Hub in the sidebar. Hubbers should be able to keep more of their hard-earned traffic flowing to their own work and not have it siphoned to other Hubbers. The EC program should have nothing to do with it. I am sorry that the folks in this thread have problems with the EC label. The reality is, the EC opt out rate is only 3%, so the vast majority of the HubPages community can benefit from the increased visibility. Our intention was not to make those who have opted out of EC feel disadvantaged, but rather, to help readers find other great Hubs to read and to reward our best authors for their hard work. Apart from ads, the Related Hubs section is where most readers click. This is a major reason we chose to display the label on Hub listings rather than on Hubs; the traffic from this label is more likely to benefit authors of EC Hubs than a badge on the Hub itself. As for encouraging readers to click away from your Hubs, yes, the label does do that I suppose. But if a reader is looking at the Related Hubs section, he or she is most likely done reading your Hub and is looking for where to go next. We want to encourage them to click on a Related Hub rather than the back button on their browser. Respectfully: We all want readers to click on another Hub rather than the back button. But when a reader is looking for where to go next I would think it is only fair that the Hubber who brought that reader to the site has the advantage in the Related Hubs section, whether they opted into EC or not. I do think it's a cool idea to have a way to collect authors' input on the Related Hubs. I'd love to explore that further but it is not something that's on our product roadmap currently. As it stands, the purpose of Related Hubs is to show the reader related content, not to promote the author (there are other sections of the Hub intended for that). If you have a Hub that is extremely related, you can place it in a group and that Hub will appear in the Previous/Next section above Related Hubs. I've used this method and it works pretty well to keep people on your hubs and reduce bounce rate. The point is that if my non-Editor's Choice hub appears in Related Hubs among three or four hubs that are Editor's Choice, my non-Editor's Choice hub is very likely to be disregarded by visitors. Since 3% of hubbers still haven't opted into the program, is this really fair? And are you sure that hubs not selected for Editor's Choice by hubbers who have opted in are all of a too lower quality to be of interest to visitors? Any hub without the label is at a disadvantage, regardless of whether the hubber has opted in. Why not? Why shouldn't ALL of the options be a way to promote the author of the hub? But if 40% of my hubs have been selected for Editor's Choice, but the remaining 60% haven't, then the remaining 60% are disadvantaged. Do any of us really want ANY of our hubs to be disadvantaged?
" to reward our best authors for their hard work" - and the definition of best authors is constantly changing. Using terms like this is not supposed to be offensive? HP's slogan should be "The beatings will continue until morale improves." Like many hubbers, I write here for my own reasons, not just to increase HP's own bottom line. Well it seems that the 3% of Hubbers that opted out are the only right ones in this whole matter. Why bother with EC? When I joined, my search traffic dropped over 60%. There's no reason why I'll be joining it again. And it's not like my hubs are of a bad quality either, so it's only fair that my hubs get the same treatment as other hubs in the Related Hubs section. Well, you've already given then a list of places to go with the 'related' hubs. So why not leave them to make up their minds, rather than having 1 hub that sticks out saying :ME ME ME CHOOSE ME!!!!!!!!!!!!" Respectfully, also, to Marina. I have had the greatest respect for you, ever since I came to HP, and still do. The reason that only 3% of the people on HubPages have opted out, may have something to do with the fact that we were all "opted in", by default. I personally would not mind being in it, if the EC program actually displayed only exceptional hubs. However, quite a few of them that I have read, were not exceptional, and were riddled with typos. That has to be sending the wrong message about HP to random readers who stumble upon HP articles when they are browsing on the internet. I saw many poorly written articles on HP, before I was imported here from Squidoo. To see them given the EC designation, is beyond belief. It also seems to me, that they should not be included in the "Related Hubs" area, on hubs that do not bear that distinction. As Cardisa aptly noted, it made her related hub seem to be inferior. Yes, they shouldn't be labeled 'Editor's Choice' when they appear in the Related Hubs section. This puts them at an unfair advantage. Not all active hubbers have opted into the program, which means EC hubs are not necessarily the best, and are no more deserving of being clicked on by visitors than other hubs featured in the Related Hubs section. Hubs that don't deserve to be clicked on should surely not be featured in the first place! Make your own "Related" section at the end of hubs with links to your other related hubs. See my latest hub for an example of this. But the Related Hubs section benefits all of us without the labels. I like advertising other hubbers' hubs on my hubs, and I like having my hubs advertised on other hubbers' hubs. And it helps keep visitors on the site. The trouble is, they spoiled it with the labels. Any hub that hasn't been selected for EC is now at a disadvantage. Not if you do your own RH section. Do you want people to navigate away from your pages or have a chance to read your own hubs first? The choice is yours. I understand where you're coming from, Suzanne, but that's not really the point in my opinion. The Related Hubs section should be there for the benefit of us all, and not only EC hubs. We shouldn't really have to come up with tactical maneuvers to prevent visitors reaching the Related Hubs section. Related Hubs has constantly changed in appearance over the years at HP and many people have challenged bits of it. Instead of worrying about it, tactical manoeuvres are one way you can take your traffic and your destiny into your own hands....and have more control over what is shown. Thousands of hubbers have been playing around with this for ages and some say it helps their hub traffic. But it's actually more about how our non-EC hubs are now advertised on other hubbers' hubs - they stand aside hubs with a very prominent EC label. We have no control over this. I know for a fact I get worthwhile traffic this way. The Competing EC labels will indeed take all of that traffic away from me. I'm very worried about a significant drop in income here. I would be glad to help get rid of the poorly written articles on the site, too, if anyone is interested. I often send messages about typos and outright grammatical errors, even though I run two full-time businesses. Cannot the HP team use a fine-toothed comb, before they decide something should be EC quality? It does put Hubbers without that accolade, at an unfair advantage. Many of their articles are stellar! I couldn't agree with you more, Cardisa! I have moved from Squidoo and I am not enjoying it here at all. Things are TOO arbitrary here. I am not sure Hubpages itself knows what 'quality' is. I agree that this labeling is inappropriate and should be removed. If the 'EC opt out rate is only 3%' why do you need the labels? This sounds like some sort of punishment! Keep in mind that so far being made EC has not be shown to confer any tangible advantage. I thought it was an experiment that had almost run its course, but I guess not. There are many, many disadvantages of having hubs removed from your subdomain. 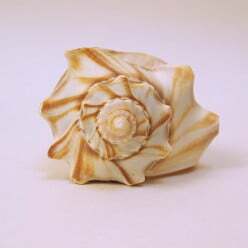 Better to keep your cream in your own cup, despite the negative reaction. If HP would change it, so hubs were not shifted from your subdomain, there would be no problems. Paul E suggested that HP were considering this - why not do it? It would improve the site map issues in an outstanding way, remove all the 301's and avoid all the confusion. Just do it! I also agree entirely with Cardisa that related hubs should NOT carry an EC label. It is unfair to their unlabelled neighbors. And I am still waiting for someone from staff to give us a true and valid reason why EC hubs have to be moved / redirected (stolen from our sub domains) to populate hubpages.com. Paul E. explained why we decided to keep moving EC Hubs to the main domain in this post. This is hardly an explanation. "We debated moving them back to subdomains, but I think it gives us some interesting data by keeping them on the main domain - We can see how google updates impact these Hubs vs subdomains." My understanding is the a long, long time ago in a land far away, Hubpages decided to go for subdomains. However, after a while it was clear that the 'mother' domain hubpages.com had lost its mojo with Google as it had lost all its pages and ranking fell. EC hubs were invented to solve this problem by shifting the best hubs back to the 'mother' domain. I don't know if this still applies, and whether shifting all the ECs back from mum to subs would create the same problem (apparently not given Paul's comment). Being part of some experiment, and creating some 'interesting data' for HP is hardly justification for potential loss of subdomain rank, traffic and authority, IMO. This is especially true given that the EC hubs are the cream of the crop in HP's opinion. Why not move them back as an experiment and see if subdomain traffic and rankings improve? Put the EC's back in the subs and everyone would join and this would stop the confusion and unfair treatment. I agree with janderson99. Not much of an explanation at all. I have many unanswered questions. What is it about being EC that is supposed to 'help' those hubs be more successful? Okay, so now they get banners and a chance to win $50 ... but how do those banners help when it comes to search engine traffic? The 3% of us who have opted out are obviously getting traffic, or we would be desperately agreeing to the EC option. To expand on what Paul E. said: "We debated moving them back to subdomains, but I think it gives us some interesting data by keeping them on the main domain - We can see how google updates impact these Hubs vs subdomains." Why not leave your 'Editor's Choice' hubs where they are, if that's important to you, and create a comparable 'Editor Choice' (without the 's) for the remaining 3% of hubbers whose best hubs get to stay on their own subdomains. That way you'd have more tangible statistics to compare. You'd be able to compare traffic changes to the 'best on main domain' vs 'best on sub-domains.' If it turns out that you have evidence that all our hubs would perform better under the main domain, then so be it. One main reason I have moved on is that I got fed up with the related pages on MY page. I have no desire to get a visitor and then show them a load of other people's stuff - EC or not. I KNOW it works the other way round but to be honest it is not where I want to be. Too many ads. Too many links. And frankly - too much rubbish on this site that STILL needs clearing out. In my opinion if you have a Group set up - the related pages should be solely from that group. I know that HP wants income, and their purpose in putting the EC Hub label is to then get the reader to stay on the site. If they read a low scoring hub in the related section, the person may leave. There is no answer, unless you opt for EC. If Admin does not think your hubs warrant EC, then you are back where you started. I thought EC hubs were a test to see how hubs did on the main site, but then they became more important when hubbers wanted recognition for these hubs. Now, they have more prestige. I love to write on this site, and the people here are a real drawing card. It is what it is, and we must accept it. Making money is important, except for those hubbers who write for the fun of it. That is the way my journey began, but I do enjoy the money now. EC hubs are a way to take away link juice from an author's subdomain. They might be perceived as prestigious but they are not any kind of indication of quality at all....read up about it. I posted a suggestion in the forum about making more use of the "More By" links for authors and simplifying the Related Hubs section for HP. I think that could be the solution for increasing reader time on Hubpages, rather than just relying on a mixed bag of ECs to pull in some views. I was worried that maybe I would be alone on this, that hubbers would think I'm blowing this out of proportion. The first thing that came to mind when I saw this was "NO NO HELL NO!!". It's like telling readers to click away from this person, because they aren't good enough. The only hub that had no label on it was mine. What does that say to readers? What if the reader was thinking of visiting another hub of mine? I believe they wouldn't bother, they'd opt for the one with the label. Paul's answer to why EC hubs are moved to hubpages.com is vague, elusive, and admidts that it is an experiment. As we objected to the default option of HubPro being "opted in", so should the default option for Editor's Choice also be "opted out" until authors agree to opt in. Then the 3% would probably be reversed, showing only 3% of authors choosing to opt in since most hubbers are not aware of what is really going on. Janderson, WriterFox, Marisa and several others have clearly highlighted the disadvantages of moving hubs from our own sub-domains to hubpages.com. Mother hubpages.com is tricking us with all sorts of tempting carrots (a chance to win $50 dollars no less) to agree to give away our best content in an experimental attempt at boosting her own dwindling rankings. Is it working? Are authors gaining anything from it? Or is the entire EC program, so sneakily presented, yet another failed experiment? 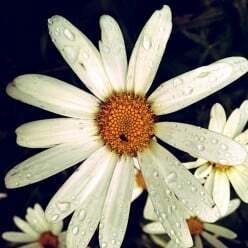 It surely has shown its true face by favoring hubpages.com hubs in the related hubs section. This leaves our sub-domains hanging in the lurch. The strange part is that if HP used a couple of sensational bloggers and made more use of quick, short competitions, writing mentorship etc (eg lots going on for writer to read), they could probably get thousands of writers visiting their site weekly anyway.....why is mother looking to the public when it could be the mother of all of the writers and nurture the talent more on here? All it would take is dressing up the blog area to be much bigger and better. They could raise PR and attract new readers to the site. How many people would love to read "Mark Ewbie meets Matt Groening" or suchlike occasionally too? The term 'interesting data' refers to traffic and revenue. I'm not happy with this at all. I left my "EC" designations up for a long, long while - until just a few weeks ago. Nothing was ever done to create an advantage in that designation, and for several reasons (as stated here, it dilutes my own subdomain), I opted out. Advantages for those who have hubs that are still EC should not be implemented in ways that are disadvantages to those who opt out. It's fine to boost, promote, highlight, whatever, but not at the expense of others on the site. HubPages is basically expecting us to allow our subdomains to be promotional sites and jump-off platforms for other writers, and they're putting a big 'Read This!' invitation on them. This all is so clearly a déja vu for me. I've seen it and I've gone through it on Squidoo and even Zazzle does it. They all seem to think it works. Maybe it does work, but I keep wonderiing who's the beneficiary of all this. I know that we, the writers, never were or shall be. I hated Squidoo in the end, due to the endless changes, but to me as it comes to these things, HP is darn close starting to look like Squidoo's twin sister. Regarding posting a notice on our profiles - that's certainly one step we can take, but the ratio of views on our profiles is very small compared to the total views we get, so it will only reach a small number of people. Also - those who are not familiar with the site will not understand what that means, and it can sound like sour grapes (which is a turnoff to many people). This is not a matter of 'sour grapes,' it is a matter of using hubs of nonparticipants to promote the work of those who do participate in the program, at our expense. 1) Restricting the hubs of non-participants from being placed in positions that have traditionally been used to drive traffic. 2) Promoting those hubs on our domains with an enticement. This goes far beyond the original claim that HP would 'promote' EC hubs in some manner (which they never did). This exploits those who choose not to participate, and it also (as said earlier) implies the work of participants is 'better' in some manner, when the reality is that those writers do nothing more than participate in the program. After reading all of your posts, I too will be opting out of the program. I didnt realize how much was entailed in this, but I certainly do not want to hurt the traffic of fellow writers. I still dont understand everything, but I understand enough to know it is not for me. I may just be one writer, but hopefully there are more like me who are making similar decisions. Thanks Cardisa. Kathleen - I feel the same way - if I had not already opted out (for other very good reasons), I would do so now in protest. Our work should stand on its own, and I would not want to be in a program that casts implied slurs on the work of others. HubPages needs to find ways to raise the site up in Google's eyes without negatively impacting the good and very reputable work of others. Mark Ewbie reminded us earlier in the thread that there's still too much dross on the site. I am sad that HP is concentrating on artificial ways of boosting revenue without comprehensively addressing the junk. I opted out not long after coming to HP. I remember the changes to ehow, right before they sold out to Demand Studios. They "demanded" that we "gift" all of our content - original photos, content, etc. - to them. I respectfully declined, and moved my articles. Some of the changes here remind me of what happed there, and on Squidoo, and FireHow, several other writing sites. Marcy, I could not agree with you more about getting rid of the dross. Every day I come across hubs that are simply junk, for lack of a better description. In addition, many of the EC hubs are rife with typos, which is impossible to comprehend. Does a human being read them, before giving them the accolade of Editor's Choice? To display EC hub as "related" overshadows many other excellent hubs that do not have that distinction. The author could be given the option to choose related hubs. Given that option, we could point readers to our own, or other Hubbers' articles that are well-written and worth reading. Cardisa brings up some excellent points, and evidently, many Hubbers are in agreement. But as far as I can see, Marcy, you are opted in aren't you? No - I opted out recently. I never (EVER) took any action to be opted 'in' to begin with. They implemented the AP program, and rolled out the EC idea, with promises that they would 'promote' the EC hubs in some manner. That was at least two years ago. They claimed we would get better traffic due to being recognized through the HP domain name rather than our own subs, and required us to be in EC and in the HP ad program to continue in the AP program (did I use enough acronyms there?). I did not see any increased traffic at all; in fact, my traffic declined. There was never any promotion effort or higher visibility. For some reason, the EC tag (banner?) has never left the hubs that were designated that way, even after I opted out. I opted out because I'd decided to drop the HP ad program and experiment without it. This caused yet another hit to my traffic - which had taken many hits from EC thing, from the stupid "Exclusives" in my collection and from the usual Panda, Penguin and the Squidoo mess. I do not know if the EC banners will be removed from my hubs, but I doubt they would be among those to be used in "Related Hubs," because (I assume) the url has reverted back to my own subdomain. You can only opt in or out every 60 days, due to the work in changing the urls. I'd actually forgotten I could 'opt out' of the EC program until very recently. I just opted out, too. Interestingly, I just lost EC status on some of my better hubs that have been edited by HP editors. I'm hopeful that this might actually be a good thing based on the traffic that I've been getting on those hubs compared to previous traffic and looking at similar hubs on my own sub. The problem is, even if those hubs do "recover" under my own sub, I don't know what turning off the whole EC thing on my entire account would signal to search engines. Maybe HP is using my account to do testing, which would be fine with me, since I was wondering if the HP domain was holding back some hubs. "Interestingly, I just lost EC status on some of my better hubs that have been edited by HP editors"
So the Hubpro editors make them of lower quality according to the EC judges, so they no longer qualify for EC status. I presume that the Pro and EC judges are from the same staff group???? This really muddies the waters. Blake, I was not aware that one could lose the Editor's Choice status. Am I missing something? If a hub was deemed to be excellent, and given the EC designation, why would it ever be able to lose it? They do lose EC status, sometimes. That was told to us from the beginning. There's no guarantee that they will stay that way. I can't really figure out why HP selected the ones they did for me to lose the status. They aren't low scoring, they are fairly high trafficked hubs (more than 100 views per day) and they HAVE been edited by an editor. Either way, I think it might end up being a good thing for me. I'll just have to wait and see. I did not know that, Blake. Thank you. Somehow, that simply does not seem right. I'm wondering if EC hubs now have to comply with Hub of the Day qualifying criteria, like having a title image of at least 800x600. I don't think that's it, because some are hubs which the editor placed herself. OK - just a thought, since only EC hubs are now eligible to be chosen as HotD. I do not see anything wrong with the display of editors choice hub of another at the end of your hub. This is a community and that is how it should be. Our membership here is to write and connect to other written works by others. You cannot tell me that you have not be receiving traffic from other hubbers subdomain here. Let us be neutral and have pure minds. I believe it has to do with how our minds process information, Mike. After all, if you were looking at 4 cakes in a bakery shop, and 3 of them had a sign on them that said "Baker's Choice", but the 4th one was minus the sign - wouldn't you be inclined to choose one of the 3 that had the sign on them? Mike, I don't see any EC hub icon in your accolades. I had dozens of ECs before opting out, but I am against this way of 'promoting' them. Displaying ONLY hubs with EC status (which are used to fatten the main HP domain and its Google juice) is not a "neutral" way of doing things. Marcy and Shades, these EC's appear at the end of hubs and I do not see them as any problem. I do not have any with the mark but it is no problem at all. I don't really get the complaints in this thread. Any hubber can use hub formatting and text to draw readers attention to their own links. They can also use the grouping feature. That's 2 chances before the readers eyes get to the related hubs section, and by that point I'd prefer them to click on an ad. Do you realize that the related hubs section carries five hubs while our group section only allows two hubs? If the reader doesn't look closely they are likely to miss the group section while the related hub section stands out much like advertisement. Respectfully, I don't think you quite understand what this thread is about. I'm understanding lol. Some people who have opted out of EC fear that their hubs are at a disadvantage when it comes to getting internal traffic via the related hubs section. If I was worried about it, I would give it a few weeks and then analyse my internal traffic stats to see what actual difference it has made and go from there. There you go again. It's not about "internal traffic", not from another hubber's hub anyway. On my own hub, the 'Editor's Choice" label would represent that Hubpages recommends another hubbers hub over MY related hubs. If the reader wanted to browse my subdomian, they would likely click away because they would get the impression that there are better articles, or writers the editorial team recommends. I agree with what you are saying Cardisa, it is very depressing when you go to one of your own articles and you see EC in a related hubs, I clicked on it to see why it was when it's about the same subject as mine. Found not one of the photos credited and mine are. Why is it a Editor's Choice? I feel like a reject. It's a very rare reader that comes to HP and browses a subdomain. Edit: Traffic from your hubs to your other hubs is internal traffic and that's what I was making reference to. I have had readers jump from one recipe to another. I have had readers jump from one article on a subject to another within the same category. So whether or not it's rare, it doesn't matter now does it? This is where I just reach the point where I get angry enough to just delete all my hubs and say adieu to you all. Cardisa, Susana is right and you know it, really. Yes, readers will go from one of your recipes to another, but that's not because they've chosen to browse your sub-domain - nobody does, except other Hubbers. It's because that other recipe appeared in the "More by..." section, or in a link you gave within your Hub, or your Groups, or in the "Related Hubs" section. The first three options are not affected by this change. The fourth option, Related Hubs, IS affected and seriously - because as you say, people will be influenced by that "EC" label and are likely to ignore the Hubs which don't have that designation. I'd like to see it changed, but let's keep things in proportion. The Related Hubs section is right at the end of your Hub - if it's a long Hub, many readers won't get that far. Only 3% of us have opted out of the EC, and judging by my own Hubs, some subjects have few or no EC Hubs at all - meaning some of the 3% won't care, either. So I suspect HP will not take the concerns of such a small minority seriously. We may have to learn to live with it, and develop strategies to capture our readers before they get to the Related Hubs section - for instance, by giving them links towards the end of your Hub (e.g. "if you like this dish, you'll also enjoy my recipe for ....." - or if you have several related recipes, provide a list of links to other recipes with a short description). It seems discriminatory against the subdomain. Is there proof that the EC hubs are doing better nowadays? I have friends who come to my site all the time and look at my hubs - not a whole lot but other hubbers do, I am sure. Susana - we have to be careful of internal links to our own work, so that option already limits us (we can't have any circular paths). In order for someone to be attracted to our links (those we include) they have to land on our page to begin with. Suppose someone has several hubs about gardening, but isn't in the EC program and is cautious about over-promoting or back-linking to their own hubs. Their other gardening hubs will not be among those featured, but hubs of several writers (who participate in the EC program) will be listed. It's a form of coercion to get writers to opt into a program that dilutes our individual subdomains. Marcy, Are you sure we need to be cautious about our own internal links if they are related? I might have missed a new rule. If there is a rule about that, then they should change it. The more pages anyone has on a topic the more Google likes their page. On a website, the more a page is linked to, the more importance Google puts on the page. As least that is how it has always worked. Barbara - cautious probably isn't the right word - but we do need to make sure they're related (some Hubbers don't know this, or don't honor it if they do know it), and you can't have a circular set of links that goes back & forth in some manner (even through several links). Some Hubbers overload their hubs with their own promos. I'm just cautious with it - and am trying to check mine for any accidental 'circles' - it's easy to create those without realizing it. If you're adding internal links because they are highly relevant to the reader, then there really is nothing to be worried about. There are definitely circumstances where you don't want circular linking, but with internal links it's not an issue if they're circular or reciprocal. You'd be hard pressed to find any website whose internal links were not. Personally I don't see this change as coercive and I doubt it's going to effect traffic so much that hubbers will feel that they must join EC. But we'll have to wait and see. Hopefully in a couple of weeks someone will do a comparison and report on their findings. Susana - the point is not whether it affect traffic in great numbers, small numbers, or moderate numbers, it's the ethics of it. This indeed is coercive - it includes negative ramifications for failure to participate. It also changes the way things 'were,' and people have a right to disagree. But what are these negative ramifications? Do we have any evidence of them or is this a discussion about what people fear might happen? I guess I'm trying to allay those fears and reassure people that this change is likely going to have zero to minimal impact on them. And if non-EC hubbers find that they are impacted by losing some internal traffic between their pages, they have the power to remedy that very easily by using the tools available to draw attention to their own links. Behind my assertion is the belief that the changes HP makes, while certainly uncomfortable at times, are for the good of the site as a whole and not to make people feel bad. Susana S., this is not only about unfairness towards non-EC hubbers, but also towards non-EC hubs. Do you think a hub displaying an EC label among hubs that don't display it in the Related Hubs section could be at a disadvantage? And why do you think we have a Related Hubs section on our hubs? Because it's ineffective? Marcy: Since when are there restrictions to linking back to our own hubs within one of our artcles? I was unaware of this. Can you show me where to find this info? This might be rude but this thread is for people who have a problem with this and for staff to address it. I am very upset about this issue and I really don't need anyone to tell me how I should feel about it. So if you don't see the need for these complaints then don't comment. The subject did say "attention staff". 3% of us are opted out, Cardisa, so you are not alone in questioning EC. However I for one am interested in hearing the thoughts of others. Perhaps they know something we don't. Like for instance, if someone has found joining EC has increased their traffic ten-fold, it would be interesting to know if that's only an increase on EC - or on all hubs. Now I'm not expecting to hear that kind of feedback, but I'd like to hear it if it exists. As has already been said, labeling EC hubs throughout the site, and making only EC hubs eligible to be featured in HubPages Weekly or become HotD is just a ploy to entice as many of us as possibe into the program. My hubs have been featured in HubPages Weekly a couple of times, so I found it a little saddening that it wouldn't happen again. And seeing all the labeling made me realize that visitors would no longer be clicking on my hubs when they appear in Related Hubs. So, I opted into the program on March 1. In other words, I fell for it. I figured that if none of my hubs were ever labeled 'Editor's Choice', then all of my hubs would be less attractive to visitors than those that do have the label. So, I decided it would be best to give my hubs at least a chance of getting the label. The reason I hadn't opted in before was because of the redirects. But, considering things haven't been going so well, anyway, since Panda 4.1, I decided now could be the right time to experiment. I now regret my thoughtlessness. And thank you, Cardisa, for opening my eyes with this thread. Hopefully none of my hubs will be selected, and even if they are, I will be opting out of the program again, anyway, when the obligatory eight week period is up - unless HubPages does something to improve the situation. Jane, I hope this does not affect you negatively but I honestly believe that one's best hubs should be on their own subdomain to help build their site rank. I think part of the reason for this rather foolish move on my behalf was my shock at seeing three or four out of five Related Hubs with the EC label. It makes them look so much more worthy than other hubs. I will never have another Hub of the Day, because I opted out of EC long ago. Guess I'm just one of the 3%!! It truly does discriminate against those of us not deemed worthy. I can't help but wonder how many hubbers don't even know they're 'opted in' to the EC program. I don't really think the 3% means an awful lot, but it's a statistic that seems to support Marina's argument. Exactly. If the default option was set to "No" (as it should be until an author agrees to participate), the 3% would be the other way round, i.e.only 3% of people would be opted in for the simple fact that very few hubbers are sufficiently engaged to pro-actively react to anything new. I think you're absolutely right, I suspect there are large numbers of Hubbers who aren't even aware of the EC program. Most people don't realize they're included - if they knew at one time, they're rarely paying attention these days. Some opted out long ago, and HP tried to promote the idea of EC hubs through an accolade, but unless someone reads the forums, they're unaware. I spent months barely ever dropping by the site. Late last year, I updated some work here and jumped back on the forum. It's so different now from a few years ago - the activity on the forum flew by so quickly you couldn't track it. It's not that way now. I can imagine a huge percentage of all hubbers aren't active. Just think of all the hubbers who signed up but never used their accounts, and all the hubbers who have abandoned their accounts (especially after the first Panda attack in 2011). I'm sure the percentage of hubbers who have opted out among all active hubbers is much, much higher than 3%. One more thing, if a Hubber feels particularly aggrieved about Hubpages trying to divert traffic they've generated to other hubs not owned by that Hubber, what's to stop them removing their content from HubPages and putting it on a site where that won't happen? Paul Edmondson, in as much as these hubs are being taken away from our own subdomain, I hope the daily earnings are being added to our accounts. I think the related hubs section is a great idea. It helps keep visitors from clicking the back button, it gives me the opportunity of having my hubs advertised on other hubbers' hubs, and I'm more than happy to have other hubbers' hubs advertised on my hubs. It's a two way street. But it stops being a two way street when certain hubs among those displayed in Related Hubs are given a label that implies excellence compared to those without the label. It's like having two products that look the same, taste the same and cost the same, but one has the royal seal of approval - which of those is the consumer most likely to buy? Visitors have no idea how this system works. They can't possibly know that a labeled hub isn't necessarily the best. It's unfair on visitors and hubbers - all hubbers, not only those who have opted out of the program. Jayne, that is exactly the point I was trying to make in my comment above to Mike, about the "Baker's Choice" designation on cakes in a bakery shop. Wouldn't that distinction psychologically influence one to choose a "Baker's Choice" cake? We instinctively gravitate to opting for what is deemed to be the best, even if it is reading material. Of course, or do UK manufacturers print the royal seal of approval on their products just because it looks pretty? Shades, I think I am beging to understand how you feel. Maybe HP should remove the label and stop moving EC hubs to their own main site. Mike, I am glad that you are beginning to understand it. 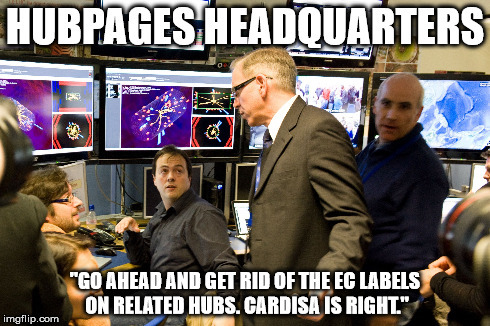 In Cardisa's example in her original post above, how the EC hubs are displayed in the "Related Hubs" section makes hers appear to be inferior. Mike - I don't know that HP will decide to get rid of the EC program (they feel they need the boost to the main HP domain name), but the labels and the 'marketing plan' need to be evaluated (as in, jettisoned, IMO). Regarding another comment you made earlier - yes, traffic is a factor on this site, and I cannot believe that it's not part of the EC choices, to a degree. Just take a look if anything in your own set of hubs is suddenly 'unfeatured' for traffic - that means that HP is not letting it be indexed, for no other reason than traffic. Oddly - the only thing we need to do to address this is to edit it a bit. Well, that's a waste of time if the hub is already high quality. But if we don't play that game, HP doesn't let Google see the hub. I especially enjoy this useless exercise when it's a title that was assigned to me during the AP, about some obsolete topic. I doubt seriously that mediocre or even crappy hubs that have good traffic are ever unfeatured. A ton of spam migrated over from Squidoo still appears on the site - I suspect there's an numbers cruncher that factors in traffic (even to junk) as a 'quality' feature. That's why they're always telling us to edit our highest traffic hubs first. Jayne - the corollary to what you say is that a hub without the EC designation can be great, but the author has decided not to participate. At this point, EC is a 'financial' designation (for the benefit of HP) not a sign of absolute contrast in quality. The EC program is also designed to get writers to participate in the HP ad program. You cannot have EC hubs (and therefore cannot be selected for an HOTD) if you're not in the HP ad program. The site's ad program benefits the site. Participating in the EC program benefits the site, because there are at least a few filters to prevent Indian Auntie hubs and the like being awarded that label. But the only "Editors' Choice" in effect is one related to revenue. This is not the way the EC program was presented to us when it was first introduced. Is there any way that either the ad program or the EC program benefits the site other by benefiting the writer even more? The 60/40 split remains the same, so any benefit to the site should be reflected in an equivalent benefit to the hubber, times the 1.5 factor in that split. Jayne, this is exactly my point. It's not about "internal" traffic as some hubbers think. It's about the disadvantage this label gives my hubs among the others. I saw this on some of my hubs as well and I didn't bother venting out as I know I'm already in HP's bad books. It seems HP is bent on destroying the hard work put in by writers. It's all about money to them at the end of the day. I wish they could first consult us writers on which options to go for as they are nothing without us. That's what annoys me about HP, they don't consider us writers important that's why they just go ahead and do what they seem to like. Please. Please. Please. Please. Please. Please. Please. Please. Please. Please. Please. Please. Please. Please. Please. Please. Please. Please. Please. Please. Please. Please. Please. Please. Please. Please. Please. Please. Please. Please. Please. Please. Please. Please. Please. Please. Please. Please. Please. Please. Please. Please. Please. Please. Please. Please. Please. Please. Please. Please. Please. Please. Please. Please. Please. Please. Please. Please. Please. Please. Please. Please. Please. Please. Please. Please. Please. Please. Please. Please. Please. Please. Please. Please. Please. Please. Please. Please. Please. Please. Please. Paradigm search, you are such a funny person. What's been forgotten on this thread is why HP have made this change. It's simply to encourage more readers to click through to another page and reduce back button clicks. Reducing back clicks across the site has the knock on effect of signalling to google that this is a site searchers stay on, which in turn builds HP's trust and in turn google sends the whole site more traffic that all hubbers will benefit from. The thread is about the labeling that now appears in the Related Hubs section. The Related Hubs section itself is a great idea, and nobody is knocking it. Not when it takes from the have nots to give to the haves. This is more than just keeping people on the site - it's money. EC participants yield a higher revenue for HP. I've got 9 more hubs that want to participate. HP is still apparently looking askance at them. Guess it's time to ship another box of donuts to San Francisco. "EC participants yield a higher revenue for HP" - how do you work that out, Marcy? The percentage split is exactly the same. We've all tried it and found that our traffic went DOWN - so in fact, EC should mean a lower revenue for HP on a Hub by Hub basis. Which makes it all the more mystifying why they're pursuing it. Maybe putting the EC label in the Related Hubs section is an effort to improve that traffic. I think it is sad that HP encourages writers to build their own identity and reputation with separate subs, yet wants to hamper these efforts with ECs. Subs are one of the best features of HP, and the recent changes to recognise writers' indentities and give them more prominence, recognises this. Yet HP asks writers for permission to steal away their best hubs for the 'mother domain' hubpages.com for an 'experiment', to gather stats to explore some future plan to sink the subs and to support some ancient problem that no longer applies. This is akin to asking writers to throttle themselves and their efforts with their subs, for very minor if any, overall benefits. The question about traffic comparisons is flawed because these hubs are the best ones, and would be expected to draw more traffic (apples vs oranges). A selected group of high quality EC hubs would always be expected to rank well. There is no way of knowing whether the hubs would do better in the subs than on the mother URL. In the past, HP claimed an average benefit of 2% for EC hubs after the shift (WOW!). However, there are no stats on how stealing away the best hubs affects the sub's reputation, authority and ranking with Google. To me the outcome must be negative - the best are gone. To me, building a reputation for my sub with Google and readers is important in the long term. HP management's focus is on the overall site and the 'community', it has less concern for the individual. I'm out and will stay out. The EC labels for related hubs are unfair, but I am not tempted by the inducements to sell my soul for pennies. PS Leaving ECs in subs would remove all the negatives. Why not just do it for the community benefit! "Leaving ECs in subs would remove all the negatives. Why not just do it for the community benefit!" If that happened, I would opt in again. However, they will never agree to do that because, right from the start, under the false pretence that they are "rewarding the best", as we now know, the sole purpose of EC's is to populate the mother site and leave the subs to languish. Is HubPages a site where authors have their own sub-domains or not? That is the question. You can't have it both ways. They want their cake and eat it. What a mess! 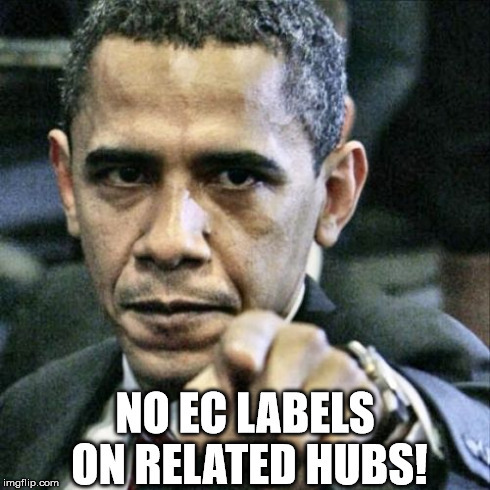 Yes - first the labeling to encourage as many hubbers as possible to join the program and drive as many visitors as possible to the main site; then exclude all non-EC hubs from being featured in Related Hubs etc. ; then unfeature all non-EC hubs; then close down the sub-domains. I wonder if that's the way it's going. As the only way to get as "many visitors as possible to the main site" would be to do away with subdomains, as at least half of the related hubs (on my own hubs) are not EC, and as over half of my hubs are non-EC but still featured, I would say that no, that's not the way it is going. They need to get adequate content on the main site before doing away with subdomains, so what better way of getting it than through Editor's Choice? Of course, none of us can know for certain what they're really up to. Undo the changes that made subs in the first place. That'll get "adequate content" in a hurry and no need to mess around with changes in the EC hubs at all, or even HAVE them. They will never close subdomains due to the significant traffic subdomains generate and can bring to the main mothership. The purpose of subdomains in the first place was to separate the not-so-hot content from the main HP domain, while retaining the traffic. That post was a little tongue-in-cheek. But I'm sure HubPages would always do what seems most lucrative. By the way - I've been here since 2010, so I remember the site before sub-domains etc. I'm one of the hubbers who disappeared for a while not long after the first Panda attack. Suzanne: I didn't realize that. I thought subdomains were a way for authors to build credibility with Google without having to be hampered by low quality or spammy hubs from others by being mixed in with them under the HP umbrella. Oh well! As I remember, subdomains were basically created to prevent poor hubs/accounts bringing down the whole site. Jayne - that was my impression as well, when I signed on. It appears HP is reluctant to rid the site of the bad content, probably because the ratio of good hubs wouldn't support things very easily - at least not until the good content is built up further (increased, and in some cases, improved). The biggest problem on the site is very old and very bad content, left here by people who probably never visit the site, and might be getting only minimal revenue - but if HP has many thousands of hubs in that group, the site would get a revenue stream from them that would be difficult to cut loose. I'm not sure why the site keeps the really old profiles on line, either - if someone has no content, hasn't been seen for five of the six years they've been here (or whatever), then why keep those 'members' in the system? Wonder if there's some sort of revenue advantage to claiming they have XXXXX number of registered users? I took a look at my followers when I returned to my account full-time last year. I'd acquired most of them pre-Panda, and nearly all of those whose profiles I visited had zero activity, although they'd left their hubs up. I'm pretty sure that the proportion of active hubbers out of all hubbers is very small indeed. Marcy: If HP continues to hang onto poor quality or spammy content, they are risking going under, and then there would be NO income, for them or anybody else. What they need to do is dump the very worst articles first along with the inactive members. What WE need to do is produce as many high quality articles as possible in order to balance the revenue loss from those dumps. One really good article is worth a whole bunch of crummy ones, don't you think? @ Time Traveler At one time, they sent emails to inactive hubbers and eliminated a bunch of them. I think the site is better now re spam and crummy articles. The people with EC hubs only have a portion in that group, so there are still a lot of non EC hubs on the site. Is it hubbers with some EC hubs who can be HOD and eligible for other perks or just the EC hubs themselves? Also Paul's figures don't seem to make a lot of difference in search for EC hubs and non EC hubs. What do you think? Jayne, to unfeature and close down the subdomains of non EC hubbers will be wickedness, and I do not think Hubpages will do such. Side note. I nominate Cardisa for the Thread of the Month award. Sorry, Non-EC folks are not eligible for that accolade. Things really are getting tough around here. Ya earned it. And with all the posts everyone made, there might even be a chance HP will have mercy on us lesser mortals. I can't speak for everyone, but that competing EC label on the Related Hubs really will cost me money I can't afford. Thanks Paradigm. I just need HP to treat all its writers fairly and the label is not playing fair. Lol, lol, lol, lol . . . . . . . I can't . . . . .
HA HA HA! Hilarious, as always! "Although, only EC Hubs are on HubPages.com and they are much more satisfying to readers than the average Hub (Search NPS of 32 for EC vs 27 for the avg Hub)." Don't know about anyone else, but I have not found that to be accurate. I'd take those kind of stats with a pinch of salt, anyway. What's the 'average hub' in this case? It seems pretty obvious to me that there's none of the kind of utter cr@p among EC hubs that you'll find on all sub-domains lumped together. Based on this, are regular, active hubbers producing 'average hubs'? If all the cr@p were gotten rid of, these stats might look a bit different. I know it seemed like I disappeared but have been busy. Thanks for all the comments and input on this thread. I want to apologize if I seemed rude at any point. I was a bit irrational at one point because I was upset. I know many people may not understand why this would upset me. Those are great suggestions for the More By section to the right...however...it does not resolve the EC vs non EC issue. The problem I have is that readers may get the impression that this writer is not a top quality writer here on HP since non of their hubs seem to be picked as EC. The EC labeling gives the impression that these are the best of the best and I am not good enough. I think the EC label should be limited to the hubber's own hub and the HP main site. The label should come off when it is shared on another hubber's hub, seeing that not all hubbers are opted into the program. Give all hubbers a fair shot and allowing the reader to choose the next article they wish to read...if any. The EC label stands out so much that readers will get the impression that they are better than any hub I have to offer. In other words in promoting what HubPages perceives are better quality hubs it acts in effect as "a put down" for the hubs of the editor who has opted out of that particular programme. It is incorrect to state that Editors' Choice represents the best hubs on HubPages. Now how about that answer to the question I asked a while back? What's the percentage of ACTIVE HUBBERS (ie logged in the last 6 months) who have opted out of Editors Choice and the scope this has to reduce the strength of their branded sub-domain? Before the labeling with the EC symbol, two of my hubs that were selected was base on traffic and not mainly quality. One receives not less than 100 views per day and the other more than 200 daily. I can't give you the answer to that question but I can tell you why I opted out of the program twice. When HP launched the program they announced that only a handful of hubbers were chosen to represent this program as it was an experiment. I was among the first people to have one of my hubs chosen. What HP did was select one of my best trafficked hub. This caused my traffic to plunge tremendously so I opted out. After understanding more about the program and hearing people say that their traffic actually got better, I opted back in. Several of my best trafficked hubs were chosen the second time and I saw a significant reduction in traffic again. I gave it the required length of time and some to see if my traffic would return...in vain. The day I opted out of EC my traffic began to return to some normalcy. The question was intended for the HubPages Support team as they've been responding to posts in this thread. Your traffic data would certainly make me very cautious about EC. It sounds very reminiscent of some of the things that happened to "chosen" lenses on Squidoo. Cardisa - (I hope you see this!) - didn't this thread have a different title at first? Did you change it? If you changed it, or requested it to be changed, that's fine. If it was changed without your input, well, that is . . . interesting. Until Cardisa sees your question, I can confirm that it definitely did have a different title. Something like 'No, HubPages Team, no, no!' Can't remember exactly, but it was along those lines. That's what I recall, too. Hope Cardisa sees this. I might PM her on FB & ask. Hmmmm. This is food for thought. Yes certainly is - I've been following this thread and wondered where it had "disappeared" to. I suppose the name change allows people to know what the discussion is about, but it could also appear that staff is trying to deflect some attention from it - why not just add in parentheses the topic instead of changing the whole thread title. hmmmm. I find admin changes titles for clarity more than anything. From that angle, your original title gave no clear idea as to the actual thread topic under discussion, and it's no wonder it was edited. I'm pretty sure the admin team didn't appreciate being addressed like a dog that just piddled on the floor. You wear that crown well, Cardisa! And I personally thought the original title served a good purpose - it attracted attention to what you were saying - No!!! I agree Marcy and I had no idea that my title was offensive in any way, addressing the team "like a dog that just piddled on the floor". All I wanted was to get their attention. Anyone who knows me knows that if I treated anyone like dogs then they are well treated. Dogs know I love them more than I love some people...my dogs know that well. The EC program is incomprehensible (why move the most lucrative content off sub-domains back to hp.com?) and unfair to those who refuse to join. Now to the point of even having forum titles changed! We are just going to have to keep all the threads on this issue alive until staff listen and either give honest answers or change their unfair policies. "Whatever we choose, we try and implement these things to benefit the community as a whole. If leaving all content on a subdomain was better we'd do it or if moving content to a different structure we'd do that as well. Right now, i don't see a clear winning strategy with our current content mix. However, I still think it's important to continue to evaluate and see what we can learn." Whatever we choose, we try and implement these things to benefit the community as a whole: This sounds like 'benefitting the community as whole' might refer to remaining in business, which, for the 'whole' would be better than folding. If leaving all content on a subdomain was better we'd do it or if moving content to a different structure we'd do that as well: Notice he uses the phrase, "all content." This sounds like they realize an 'all or nothing' shift would not work, because of the huge ratio of really bad content. They need some very 'good' content on HP's domain to try to build back the SEO rankings. This doesn't imply that all EC hubs are great - it just means they're at least better than the real trash on the site, and that the writer either didn't know to opt out, or has allowed the content to be put under HP's name. Right now, i don't see a clear winning strategy with our current content mix. However, I still think it's important to continue to evaluate and see what we can learn: The key phrase here is "with our current content mix." It appears HP recognizes the issues that come with allowing the bad and ugly to be mixed with the good, and it hasn't yet found a fiscally acceptable way to jettison the bad content that is sinking the ship. My biggest hope is for HP to finally cuts its losses and ruthlessly rid the site of the junk on it. This could perhaps mean an "all or nothing" approach - if and when the site decided to permanently get rid of the spam and the junk, they might want to have all remaining hubs under the HP domain. I'd probably be okay with that idea - I think the biggest issue for all of us is the bad, bad content. I would not have published here if I'd recognized that there were no filters to keep out spammers (or those who simply cannot write) and that there's insufficient follow-through when you report bad content. Your last paragraph expresses exactly how I feel about the current state of HP. The number of articles here that do not even seem to be "articles", is shocking. Marcy, about a week ago you said you'd recently opted out of EC and, "I do not know if the EC banners will be removed from my hubs, but I doubt they would be among those to be used in "Related Hubs," because (I assume) the url has reverted back to my own subdomain." So that makes me wonder what conclusions you can draw from your stats. Are the views higher than you'd expect now? Or are you still 'waiting' for them to recover? They still appear with the HP url - and it's been a while since I opted out. Traffic stinks - the HP designation did not improve traffic one bit and may well have caused it to decrease. At the time my hubs began getting that designation, I thought Panda & then Penguin were the problems - they were, but the real issue is how P&P treated sites like this one. Because I had to be in the program in order to finish the AP gig, I didn't opt out. Had I not been in AP, and had I had more experience on the site, I would have opted out. I can see now that it did not benefit me. I'm happy for those who benefit from it, but being in that program should not be at the expense of those who choose not to participate. It will be interesting to hear your feedback in coming months, Marcy. I opted out a long time ago. I think it is now about 18 months since EC was introduced. It must be about a year since I opted out. I wasn't prepared to wait any longer. I'm going to chime in because two of the hubs that are in that screen shot are mine. 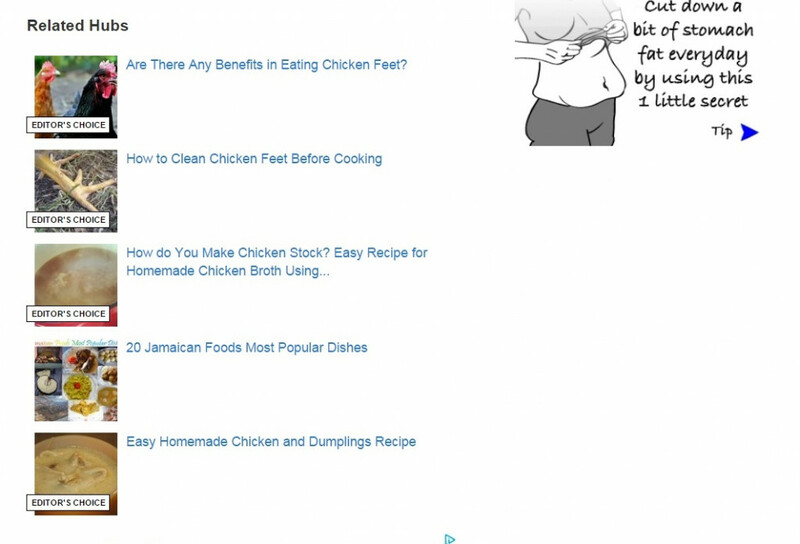 For the "How to Clean Chicken Feet Before Cooking" hub, 3 visitors from Cardisa's hub. For the Hub "How to Make Chicken Stock..." 0 visitors have come from Cardisa's hub in the past month. My thought after looking at the numbers is that this really isn't that big of a deal. Especially since I have 2 of the hubs on that list and can actually look at the traffic and where it's coming from. It's not helping my traffic at all. Thanks for sharing that perspective - I think the issue some of are raising relates to the semantics of a label that seems to say 'This Hub is Better,' and the fact these banners are displayed on the sites of writers who, by choice, do not participate in the EC program. The words Editors' Choice are now being used as a visual enticement to drive traffic to certain hubs, not just as an internal 'pat on the back' to writers, with an accolade. This is not fair to those of us who write good content but choose not to participate in the program. It's the principle of the thing, and the ethics of it, not the numbers. Perhaps HP could sift numbers so that only hubs above a certain Hub Score (the number appearing on individual hubs) were place in positions where they can drive internal traffic. If the sweet spot is a Hub Score of 70 and above (or whatever), then ALL hubs that have those scores would be used for the 'Here, Read This' links. Better yet, get RID of all the junk, and all the spammers, and any hub on the site should be worthy of promoting at that point. I still see spam hubs that were reported months ago. That's the thing though, people CHOOSE not to participate in the program which means those people won't receive the benefits of being IN the program. It's not HubPages being unfair, it's hubbers making a choice based on what they believe to be best for their account. Opt out and you don't get the same benefits as those of us that have chosen to opt in. The EC accolade is a psychological trigger and people will be more inclined to click on a hub that has the Editor's Choice accolade over one that doesn't because the mind will automatically think that it is the better choice. It doesn't matter if there is 1 EC hub and 4 that aren't, people will choose the EC hub the majority of the time IF it is on the subject matter that they are reading about at the moment. I agree with you about the spam hubs and will add getting rid of the broken english hubs. Those drive me NUTS when I see them on here. Many writers have found they get more traffic on their own, and they don't want to be part of the EC program. It is NOT universally a 'benefit' to all writers, and many of the best writers here do not see a benefit in the EC program. However, HP has now created a way to divert traffic from their hubs. This means HP is using those people in a way that is a disadvantage to them, even though many readers may have landed on this site because of their good work (and strong rankings in search results). What you are saying is that we should roll over and die because we opted out of the program? HP never put the cards on the table in the first place by telling hubbers the real benefits to the program. When any new feature would be implemented there was never any real discussion, only announcements. So because I opted out of the program, HP has all rights to advertise these hubs on my account? I thought the whole idea was to give everyone equal chance. All I am asking is that hubs remain labeled on their own subdomains and on the main site. Remove the labels from others hubbers hubs. That is all I am asking. I really don't give a rat's a** who is opted in or out. Let my hubs breathe on their own. I don't need to be bribed to join a program where the benefits are not in my favor. Removing my best hubs from my subdoman weakens my site and will ultimately lead to me being penalized by the big G. Plus, Google hates redirects, that is why EC hubs lose traffic when removed to main site. Now let me ask you something, who benefits more from this, the hubber or HP? Why do you think HP is advertising the EC hubs so blatantly on these accounts? Answer: To pull in the traffic that the hubs can't pull in themselves. The majority of these hubs have low traffic (lost traffic due to redirect),so this is the compensation. This label is designed to pull the organic visitor away from the original hub they came to read, nothing more and this is where it gets unfair. The banners could prove completely ineffective, in which case they are pointless. However, I can't imagine they'd ever put EC hubs at a disadvantage, nor can I imagine they'd put non-EC hubs at an advantage. There comes a time when enough is darn well enough! I have had it. This label is designed to pull the organic visitor away from the original hub the came to read, nothing more and this is where it gets unfair. The label not only draws organic traffic away from the hub someone landed on, it draws traffic away from the entire account if the writer is not in EC. This new twist was never explained early on - many of us would have opted out from the start if that had been the case. In fact, there were never any specifics explained when EC was rolled out - only vague promises the site would promote these in some way. I assumed that would be externally, not what we are seeing now. It took forever before the site even added the accolades. The related hubs are at the end of the hub, which means the visitor has already finished reading it. I think HP just wants to keep visitors on the site by offering related hubs section. As concerns the EC labels on the related hubs section, there needs to be more data as to whether it has a negative effect on one's traffic. Maybe we should give them more time to collect data and make decisions based on it. As Sue rightly said it...you are missing the point entirely. My major concern is that they should stop moving our EC hubs from our subdomain to their main site because it affects our subdomains.If they want contents on the main site, they should hire writers for that. "Right now, i don't see a clear winning strategy with our current content mix". How much more time is needed? Besides, that is not the point of this discussion. We are talking principles here. Any experiment conducted at the expense of those that have responded to a given choice not to participate is blatantly unfair. PLEASE remove EC labels from Related Hubs. Sue Adams, I believe HP is monitoring this forum thread and understand the feelings of writers here. This might simply be a coincidence, but I've noticed another 'unusual' event. Perhaps someone might care to take a look and tell me what you see. I wrote a hub recently expressing an interest in finding (or creating) the ultimate website for professional writers online. I just went to take a look at its stats to see if it was attracting any search engine traffic yet, and saw the 'More by LTM' featured hub was from a different 'group' of hubs - which surprised me. Because in my view it was probably the least appropriate example of my work to link to that hub, I unpublished the hub. Yet the link is still there. When I click on it, I get the 'this hub is not published' page. Seems odd, even after refreshing the page several times I still get the same unpublished hub featured. Now I'm not suggesting for a moment that one of my least successful hubs is deliberately and permanently tied to a hub encouraging other professional writers to consider contacting me with a view to perhaps establishing a new site for writers ... lol, because that would appear a little paranoid, wouldn't it? I am, however, wondering why the featured hub doesn't automatically change from time to time ... particularly when I've unpublished it. Would one person please take a look and tell me what you see? Thanks. I'm seeing the same as you, I guess: Funeral Home Hints - No longer published. Thanks for looking, chasmac. I guess with time it will change. Seems a bit extreme to have had to unpublish the hub though. The "More By" box doesn't use Groups. I think it's random, because it doesn't even have to be in the same category as far as I can see. LTM. If I understand things correctly, I have likewise been snuckered in this regard. The unpublished hub in groups is only visible to you. If you sign out, it will indeed disappear. Hello ps. I had in fact signed out before posting here, just to make sure. But thanks for mentioning it, because I might not have thought of that. I notice chasmac had the same result as me. I looked and the hub in the more by is how to grow chia seeds. Editor's Choice? Worth it or not? What is the Editor's Choice Program really?